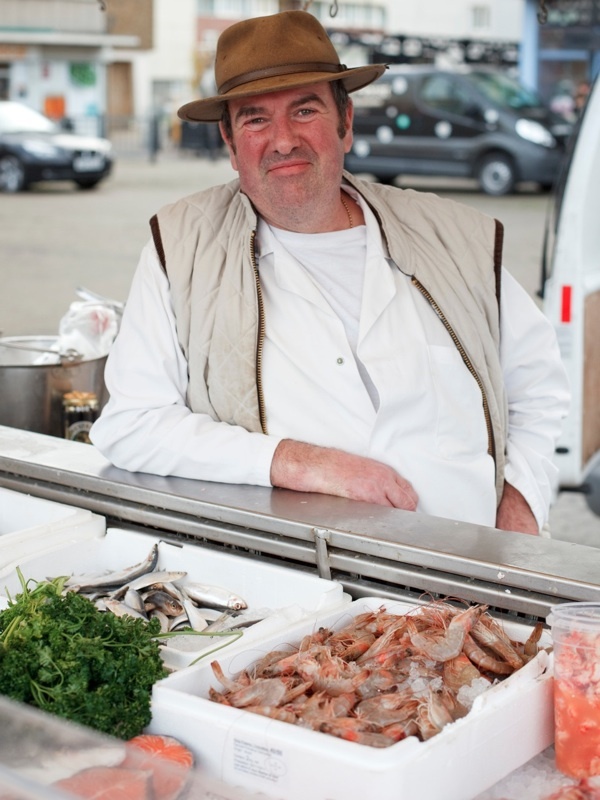 “It’s West End quality, East End prices!” declared Del Downey, third generation fishmonger, in proud response to my delight at buying a beautiful pair of fresh plaice for a mere seven pounds at Globe Town Market Square in the Roman Rd yesterday. It was a rare flash of emotion for such a dignified gentleman. 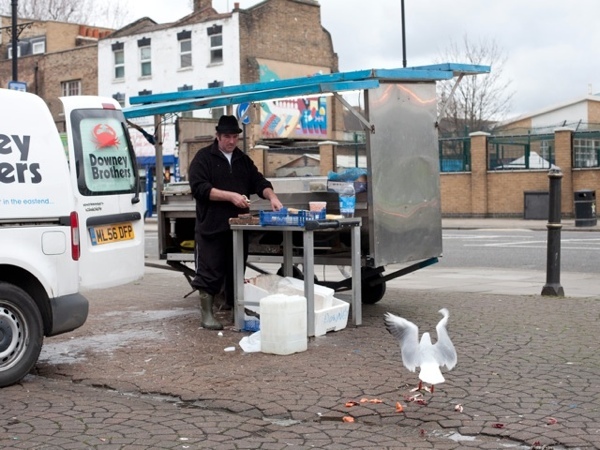 Yet when Del heard the cry of a gull overhead and placed a couple of sprats on the roof of his van, and two seagulls came and he confided to me they were called George and his wife – after his father and mother – I realised Del was a fishmonger with the soul of a poet. “I’d like to think, if there is an afterlife, it might be the spirits of my mum and dad, looking after me.” he added with a tender grin, before returning to the business of cleaning fish after this unexpected moment of poetry in the midst of the working day. I had not come to Globe Town Market Square in search of poetry and, perhaps, this nineteen fifties shopping precinct is not the most picturesque of locations for a market. But – speaking with Del Downey the fishmonger and Leslie Herbert who sells fruit and vegetables from a collection of ancient barrows – I quickly discovered that these two traders, who have operated side by side here as long as anyone can remember, carry between them an inheritance of East End market life stretching back generations. And, if Del’s speculation is true, their forebears are still hovering overhead in the form of a flock of herring gulls. And then, as if in confirmation of this, Del intuited that his next customer wanted the middle part of a piece of cod, which prompted her to admit, “I’m sixty and my mum brought me here when I was a baby. I remember your dad, short, fat and handsome. I’ve been coming here all my life.” Del smiled coyly and wrapped up her fish. “See ya’ later!” she called brightly and was on her way. 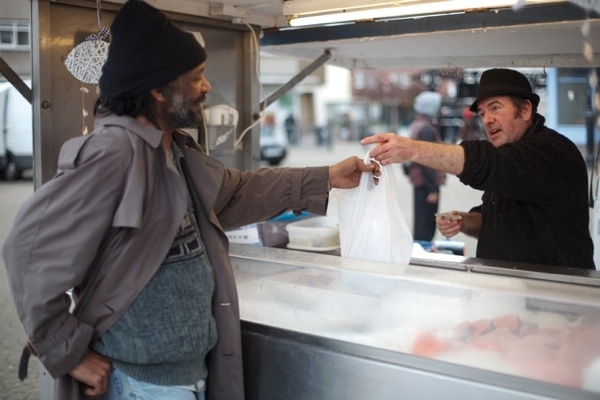 “I’m quite happy with the trade I’ve got,” Del confessed to me, with a private smile of satisfaction as he returned to filleting mackerel, his bare hands glowing pink in the icy cold to match his ruddy features that were as weather-beaten as those of a fisherman. Certainly there was a constant stream of custom, even as we chatted, though Del assured me that this was a quiet week because the supply of fish had not yet fully resumed after the holiday break. Leslie stood and observed the line of different races all waiting to buy fruit and vegetables at his stall. 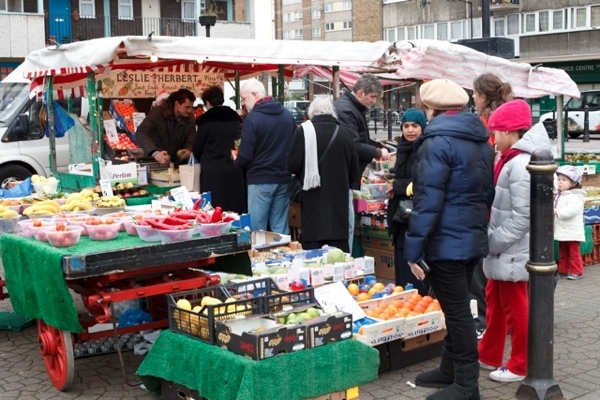 As former East Enders have moved out to the suburbs and newcomers have taken their place, he has discovered that immigrants bring a culture of home cooking which has benefited his trade, counteracting the loss of business to supermarkets. “We are always especially busy around Ramadan. Dates are a big seller,” he told me, contemplating changing times. 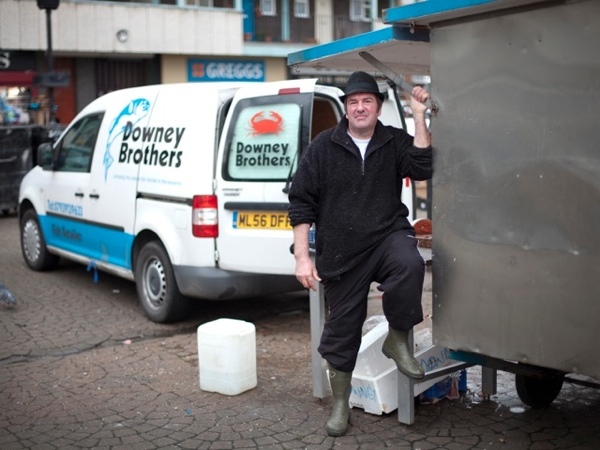 Del Downey sells his fish at the price his regular customers can afford and accepts a low profit margin as a consequence, because their loyalty means he is able to earn sufficient to make a modest living that he knows is reliable. 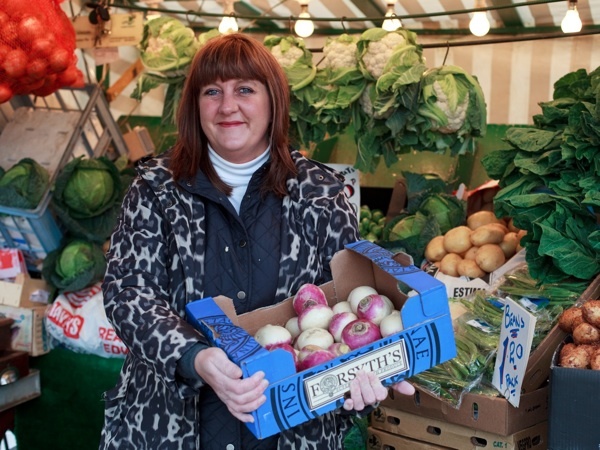 Similarly, Leslie Herbert sells fruit and vegetables that are fresher and cheaper than you will find in a supermarket. 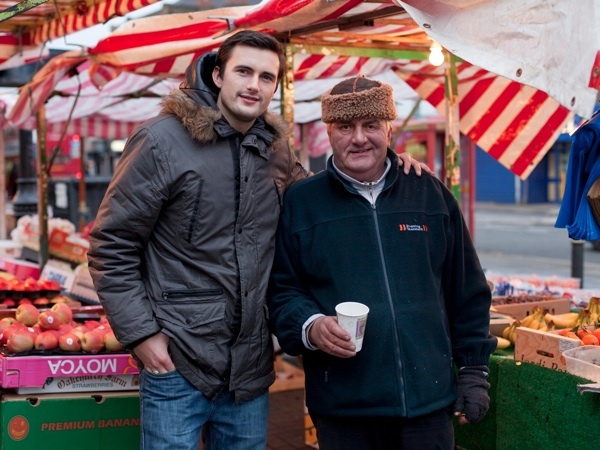 So, although Globe Town Market Square once used to be full of stalls and now there are only a few, I hope there are enough people in the East End who recognise the value offered by such a market – enough to sustain these stallholders and keep this culture alive. Leslie Herbert with his son Mark. Carol Goggin, another celebrated stalwart of Globe Town Market Square. Del and George, his pet seagull. 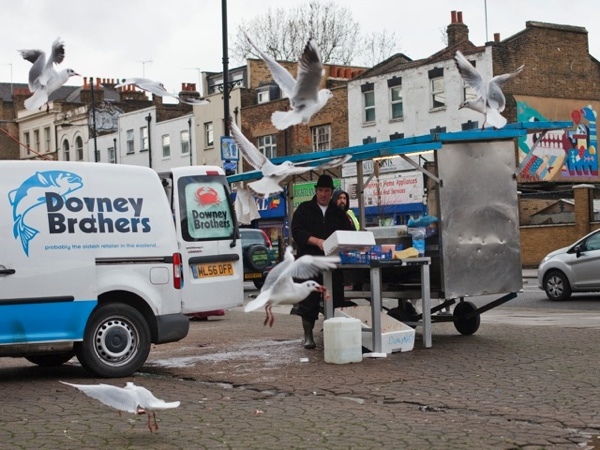 pet seagulls — to think they are beneficent spirits! this just about kills me. you live among wonderful people! Excellent report. 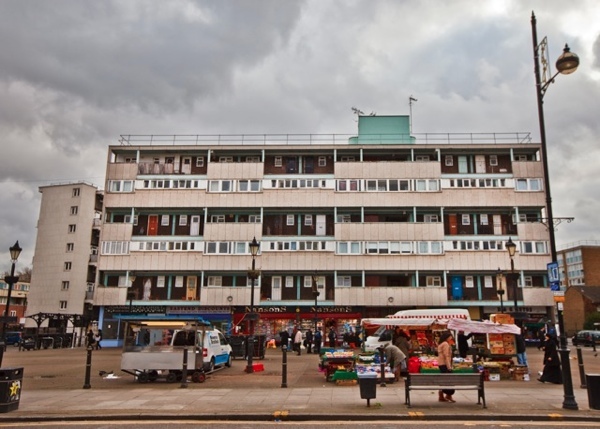 The Downeys and the Herberts have become very much part of our lives as incomers to the East End. I just want to comment on how lovely these people are. They never fail to bring a smile to my face. All the success they have is well desserved and I wish them the best. We live a stone’s throw from ASDA on the Island but every week on a Saturday go to Globe Town for fabulous fish, fruit and friendship with traders it is a pleasure to do business with. If you like to know about the fish you are eating…ask Del. Last week’s halibut will live in my memory for ever!